Aberdeen, South Dakota is known for its Midwestern hospitality and close-knit community. Kessler’s Food and Liquor has been a household name in the town of 28,000 people since the family business started in 1940. Kessler’s has always been committed to expanding services and keeping up with changing times. October 2018 brought another update: Freshop helped Kessler’s Food and Liquor launch both their e-commerce website and a Personal Shopping Service. The Service has been a massive hit with sales through the shopping app in excess of $100,000 in the first 90 days. The pressure is on for local, independent grocers to exceed customer expectations with updated digital offerings and fulfillment services. Big players like Walmart and Kroger have the budget and reach to experiment with delivery, pickup, and online ordering to make grocery shopping as convenient as possible. For the local grocer, the move into the digital space must be more calculated, making Freshop’s scalable platform right for Kessler’s, providing every feature available from the big players, plus some special features unique to Freshop. The Walmart SuperCenter in Kessler’s backyard announced the launch of their Personal Shopping service in September, just as Kessler’s prepared to launch their own pick up service. While this might seem like a huge issue, Kessler’s took it in stride, using the buzz Walmart created around online shopping and a better understanding of their customer base to compete. Freshop’s online grocery platform and Personal Shopping app aided Kessler’s in strengthening customer relationships, bringing Kessler’s in-store experience online. Unlike the competition, Kessler’s charges no additional fees for orders over $25, and offers the same prices online as in-store. Kellie Bauman leads the team of Personal Shoppers and trains her staff to pick orders like they would when shopping for themselves and their families. Freshop’s “Best Practice Guide for Personal Shoppers,” along with other guides and articles in their Retailer Portal, provided Bauman with the tools to build her training program. In a combination of Facebook posts and live events, brochures and flyers, and radio ads, Kessler’s was able to share specific details to educate consumers on how to use the service and app. The team even helped customers in store download the app to their personal devices. 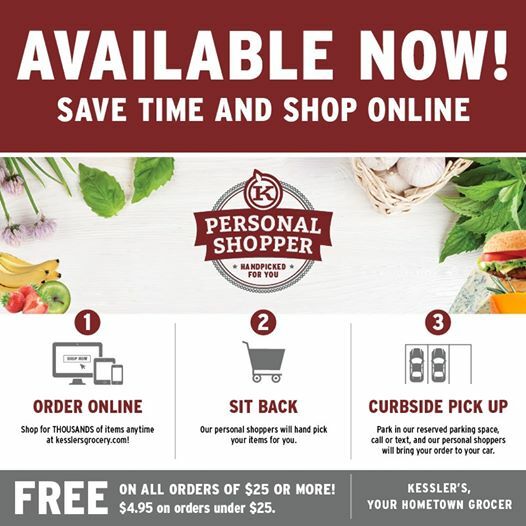 Kessler’s knows their customers want to stay connected to their grocery shopping even if someone else is putting items in the cart. Along with automatic in-app updates on order status, Personal Shoppers also send text messages to update their customers as they pick orders, and include personalized thank you notes in each order. “We leave a personal note on every thank you card and we usually try to reference things in their order. If someone’s buying tortillas, cheese, ground beef, and lettuce, we will say ‘Enjoy taco night!’” said Bauman. “I just returned to work after maternity leave, and I live 45 minutes from town so I’m away from home from 7AM-6PM. You guys are saving me so much time by being my ‘Personal Shoppers’ so I can get home to my kiddos. THANK YOU Kessler’s for doing this. It’s more than just convenient—you’re making me feel like a better mom,” wrote one customer. The Freshop support team works directly with Bauman to keep the Service running efficiently. Through the Retailer Portal, Bauman and her fellow Kessler’s team members are able to submit Help Tickets to the Freshop team and read Support articles on best practices. Freshop worked hard to create an intuitive, scalable process for online shopping, and empowered Kessler’s to build a remarkable team to lead their service. The first three months of Kessler’s Personal Shopping Service were an outstanding success. Since launch on October 15, Kessler’s filled more than 1000 orders exceeding $100,000 in sales with an average basket size of around $99 per order. “The Personal Shopper service at Kessler’s is terrific! The staff are friendly, helpful, and really caring about their customers. Every order is fulfilled showing exceptional customer service and accuracy. The website is set up well, too, so customers can be specific about their produce. So thankful that Kessler’s is offering this great service to the community!” - Jessica D, Kessler’s customer. Moving forward, the team hopes to expand operations to include more Personal Shoppers on staff and in the future offer delivery to their customers. Freshop is excited to continue working with Kessler’s to build lasting success. Freshop is the leading online grocery platform for independent grocers, powering websites for over 1,200 stores in 44+ states and 10+ countries. Our goal is to equip retailers with the tools to compete in today’s digital marketplace. Store branded websites and apps, and a user-friendly dashboard give retailers complete control over their digital offerings. Our dedicated support team is there for retailers every step of the way, helping retailers exceed customer expectations. Learn more about how partnering with Freshop helps retailers compete online at www.freshop.com. Let’s build something great, together.